Dude Looks Like a Lady is a pleasantly unpretentious experience. Shorn of frippery and glitz, the show is 'merely' four extremely funny comedians ricocheting off one another like they're in a pinball machine. 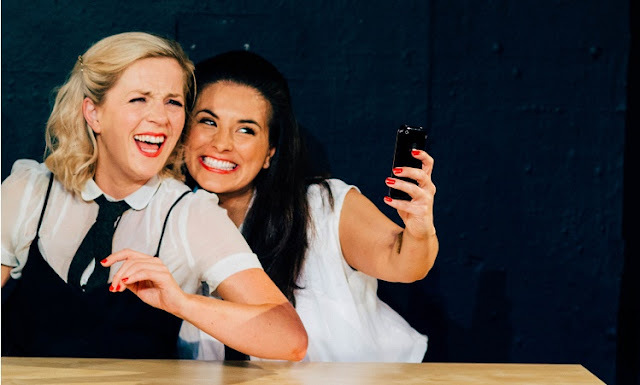 The four, Amanda Stauffer, Juliet Catton, Jessica Ashworth and Leanne Davis, work through just over an hour of absurd sketch comedy, displaying an uncanny skill in skewering gender roles in society. A highlight comes early on in a sketch that pokes fun at both romantic comedies and creepily romantic "milady *doffs fedora*" types. A woman rides the tube, a man gets on and 'accidentally' drops his papers on the floor. As the woman bends down to help him pick them up he hits play on Wet Wet Wet's Love Is All Around. Their fingers touch. Their eyes lock. It's a classic 'meet-cute'! But this is real-life, where there aren't any Hugh Grants (well, okay, there's one), so his starry-eyed advances become more Lars von Trier than Richard Curtis. The group have identified a rich seam of comedy and they're determined to mine it for all its worth. I'm not going to list all my favourites - I don't want to spoil the punchlines - the best of which zoom in unexpectedly from leftfield. They broadly share territory with current feminist comedy kingpin Amy Schumer (and draw from the same tradition as Smack the Pony) - highlighting incongruities in male/female relationships, poking fun inwards as well as outwards. This self deprecating streak results in a pleasingly conspiratorial relationship with the audience. The Etcetera Theatre is a small venue, yet was filled with a good natured, optimistic crowd who were obviously fans of the group. This easy relationship between audience and performer resulted in a lovely communal atmosphere, even extending to the brief moments of audience participation. Generally the reaction to seeing comedians scan the front row for a target is soul-consuming dread. Everyone averts their eyes as if they're suddenly antelopes in front of a lion. Not here. As they pepper random audience members with questions, there's no cruelty or malice. The guy sitting next to me even gets given a pint of beer for participating! Honestly, I've been to a boatload of comedy gigs and never have I seen the performers supplying the front row with free booze. But, as with practically all sketch shows, there are a couple of sketches that either run on a bit long or simply don't work that well. A repeating sketch in which a police officer mishears words isn't funny the first time (the gag: her boss says "badge" and she hears "vag") and is even less funnier the third - even with a semi-predictable twist. Less egregiously there's a couple of sketches that inch into self-indulgence and could use a bit of a trim. There's also a scrappiness to the proceedings that, if you're feeling charitable, you can write off as contributing to the personable friendliness of the show, but could just as easily be an indicator that a smidge bit more polish is needed. Even so, I can't deny I had a good time. If a comedy show makes me chuckle three or four times I'll mark it a success, and Dude Looks Like a Lady wrung countless head-thrown-back guffaws from me. These four have the enviable combination of writing and performance skills, bound up in an irresistibly infectious good-time chemistry. Dude Looks Like a Lady returns in Feb 2016. Dates here.